The online movie rental service Netflix, for example, and the British broadcaster BBC, are already planning to implement DRM based on the encryption features in HTML5. Netflix designates this copy protection as "HTML5 Premium Video Extensions" , and the BBC considers it justified to restrict access to its programs to British TV license payers only . The W3C proposal for the Web Cryptography API  goes by the name of Encrypted Media Extensions (EME) and is currently in the draft phase . We decided to look at the Web Cryptography API and see what the fuss is about. 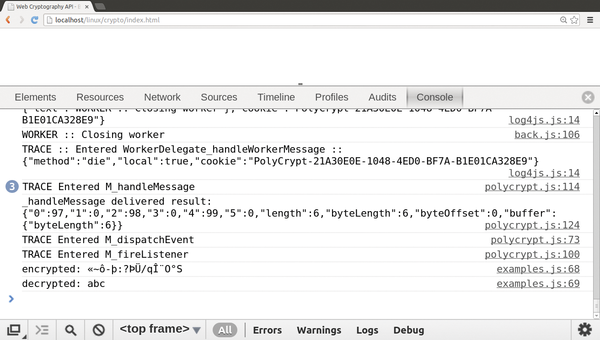 Figure 1: The console in the Chrome browser uses PolyCrypt to evaluate the call to encrypt("abc") . The Web Cryptography API supports several encryption technologies. The AES  symmetric encryption method, for instance, is suitable for protecting application data in a cloud. Listing 1 shows how to use AES together with the Web Cryptography API. Line 1 stores a key (truncated in the listing) for encrypting and decrypting application data in the variable encRawKey as a hexadecimal numerical sequence. The encAlg variable in lines 2-9 stores a configuration object. The browser runs the importKey() function asynchronously; this also applies to the API methods encrypt, decrypt, generateKey, sign, or verify. If successful, the browser executes the callback function specified for all the methods for the onComplete event. Lines 11 to 20 show this callback function. The function uses the imported key in the key variable in the encrypt call (line 13) for the encryption process. The RSA asymmetric encryption method  is suitable for protecting application data in transit via WebSockets and WebRTC. In contrast to a symmetric method, RSA uses a pair of keys. The two communication partners use the third-party public key to encrypt, and their own private key to decrypt, a message. Additionally, RSA is used to sign a message, thus allowing its authentication. Listing 2 shows the combination of RSA and the Web Cryptography API for signing a message. The configuration object in lines 1-7 provides information for generating a key pair in the call to generateKey() (line 14): The name field selects a variant of the RSA algorithm, whereas modulusLength selects the modulus to be used and publicExponent the public exponent. Lines 8 to 11 save a configuration object for parameterizing the calls to the sign() (line 16) and verify() (line 18) methods. The hash parameter stipulates the SHA-1 algorithm, which generates a checksum for the text message.